With consumption demand estimated to slow down on account of the agrarian crisis and the liquidity crunch, the outlook for retail companies may be subdued in the coming year. Nonetheless, the December quarter earnings should reflect the benefit of the full festival season and this should bring cheer. In fiscal year 2018, the festival season was split between the September and the December quarter with Dussehra falling in September. The current quarter results would be critical for Shoppers Stop Ltd, which saw like-for-like sales growth at 3.6% for the September quarter, adversely impacted by a decline in the measure in the month of September. Like-for-like sales growth is the comparable sales growth of stores that have been operational for over a year. Of course, there are company-specific factors that can alter fortunes regardless of how broad themes play out. Future Retail Ltd, for instance, is expected to benefit from the festival season impact this year. Specifically for the Future Retail stock, investors would do well to track the supermarket chain, HyperCity’s, financial health. The unit’s earnings before interest, tax, depreciation and amortization (Ebitda) performance has shown a consistent improvement in the last three quarters with its negative Ebitda margin dropping to 6.7% in the September quarter. Future Retail said it is on track to achieve 5% Ebitda in upcoming quarters in its September quarter update. On an overall basis, one factor that investors should closely watch is how discounting from online counterparts plays out and the resultant impact on the sector. 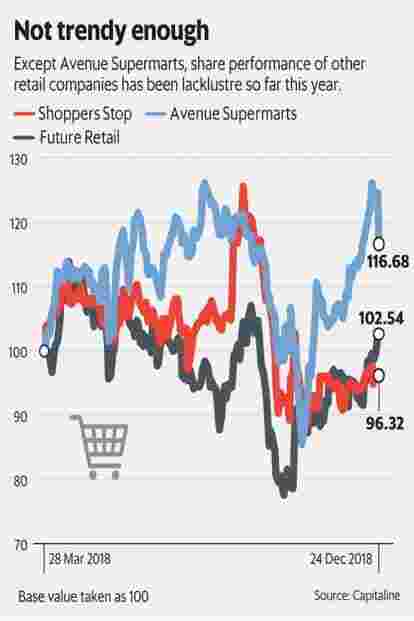 For Avenue Supermarts Ltd, the stock market darling of the retail sector, investors would have to watch whether earnings trajectory remains robust versus its rather steep valuations. Avenue Supermarts runs the D-Mart stores. Pace of store additions needs to be watched in case of D-Mart, considering for the half year ended 30 September, store additions weren’t exciting. Titan Co. Ltd, which derives a good share of revenue from jewellery, is one of the key beneficiaries of the shift to the organized sector. Analysts expect the good run to continue for the firm. Wedding season demand is likely to augur well. Additionally, consumer preference for trusted brands is beneficial too.